March 26, 2019 March 23, 2019 by Jessie Sanders, DVM, CertAqV1 Comment on What’s at the bottom of your pond? Just like your cats and dogs, your pet fish can benefit from a yearly wellness exam. By bringing your vet in before you notice any issues, health problems can be caught earlier and treated more effectively. 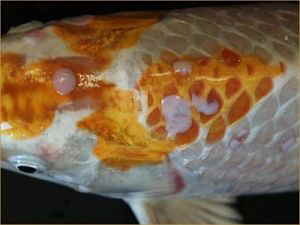 The spring months are the most common times of year when problems with koi occur. Save yourself the stress of trying to guess your koi issues and get it straight from the best trained source in California & Nevada. Our Spring Pond Package for 2019 will have some new benefits for all pond owners. To schedule, call (831) 728-7000. With the increased incidence of gonadal sarcomas, we usually do not catch them in time, given their sneaky, lack-of-external, appearance. By implementing regular screening, we can find these tumors much earlier and fish can undergo life-saving surgery. Watch a full tumor removing surgery. With the closing of our store, the Fish Vet Store, we want to be able to provide our clients with all our best product recommendations. All Spring Pond Package clients will receive a 20oz bag of UltraBalance Maintenance koi food, an API Freshwater Master Test Kit + kH test kit, an infrared thermometer and a signed copy of Dr. Sanders’ book, Healthy Koi Made Easy. Fish health is directly linked to water quality. Our spring pond checks include full assessment of fish water quality parameters. If there’s an issue, our veterinarian will make recommendations to correct them quickly and easily. Call (831) 728-7000 to schedule your Spring Pond Checkup today.